Because Wednesday was a holiday (see previous post) we got to stay home and work on some projects around the house. Brian recently discovered that a drainage pipe at the back of the house was completely clogged with tree roots and dirt. Not only that, but it was a weird amalgam of steel pipe, clay pipe, and two different sizes of PVC. This needed to be fixed, since rainy season is approaching and our house is built on sloping ground (we’d rather not deal with a flooded basement!). 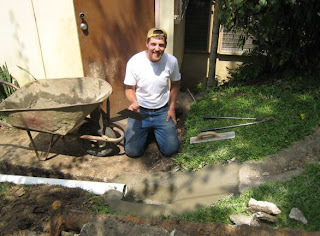 So Brian dug out the old pipe and laid down a new one, and then built a new cement catch at the mouth of the pipe.